Candidate must be an accomplished bronchologist with noted track record of publications, teaching, workshops, and clinical practice. Candidate must have a career-long achievements consistent with Jean-Francois Dumon’s ability to inspire others, disseminate rigid bronchoscopic techniques and improve the knowledge and understanding of central airway obstruction. Candidates will be evaluated based on THREE CRITERIA: (1) Ability to inspire others, disseminate technical skills in rigid bronchoscopy, and improve knowledge and understanding of central airway obstruction, (2) Impact of interventional bronchoscopy-related publications, training videos, workshops, and lectures, and (3) Personal statement of merit and letters of support. Each award recipient will receive the specially designed medal and framed award certificate. John Beamis (2007), Henri Colt (2008), Hermann Tonn (2009), Heinrich Becker (2010), Jean-Michel Vergnon (2014), Masahide Oki (2016), Pablo Diaz (2018). 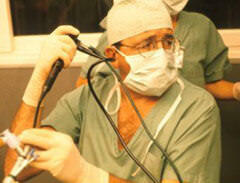 *Jean-Francois Dumon is recognized today as the “father” of interventional bronchoscopy. From his Centre Laser in Marseille, France, he generously hosted bronchoscopists from around the world. By providing observational and hands-on experiences to hundreds for almost thirty years, he rejuvenated the art and science of rigid bronchoscopy, laser resection, video-assisted airway imaging, and stent insertion. Those he inspired continue to disseminate innovative techniques for managing central airway obstruction to the benefit of their patients and society.